Pops of colour in your kitchen are almost as a good a pick-me-up as that morning coffee. Once the functional aspects of a kitchen have been designed, get creative and experiment with ways to break up solid expanses. Although it can be a balancing act to find out what works together tonally, remember that contrast is key, so don’t be afraid of pairing a zesty orange with black granite surfaces or hot pink against a walnut veneer. Here are few tips and tricks on adding a little extra oomph to your kitchen. A mainstay of kitchen design for decades, splashbacks are not only easy to clean and highly durable, but they can also inject definition and character into a minimal scheme. Bright accent colours bring a contemporary look and are ideal for setting off a stainless steel vent hood. However if you are looking for a more decorative focal point, attention-grabbing tiles could be the way forward as mosaics and geometric patterns are dominating current kitchen trends. When considering the finishing touches to a breakfast bar or an island, candy-hued stools are perfect for adding pep to your kitchen. Metal seats lacquered in bright primary colours are easy to match with appliances and accessories, whilst fabric-upholstered chairs create contrasts when patterns are daringly mismatched. Take note though, using larger chunks of colour rather than more intricate patterns makes a bolder statement that’s also easier on the eye. Instead of locking away the products that define your kitchen’s function, celebrate them! Whether you choose floating wrap-around shelving or wooden racks supported by decorative brackets, the options for open shelving are endless. 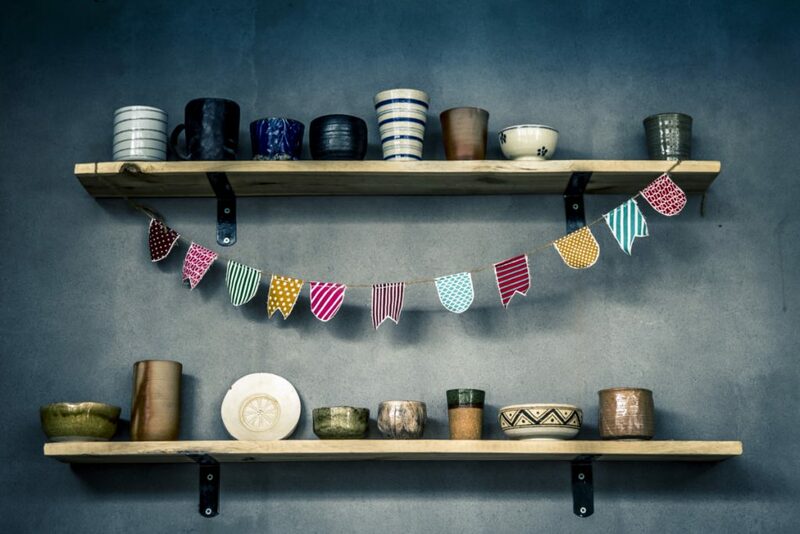 Use them to flaunt your prized plates and eclectic crockery or artfully arrange colour coded cookbooks and clear glass jars filled with dried goods. For less permanent colour pops, a bowl of lemons and limes or a vase of fresh flowers instantly boosts counter appeal and even the simplest of accessories, such as dish towels, can add a real touch of flair. Also, many people wince at the thought of hanging art in their kitchen, but an attractive landscape can be the next best thing to a window in a breakfast nook and an empty wall is easily transformed into a gallery by hanging prints, paintings and photographs. The kitchen is the heart of the home, so make sure you pack it with personality.